Someone asked for a show of hands: “Who uses ad blockers?”. Followed by another show of hands: “Who works in digital marketing?” Hmm, what was that saying about biting the hand that feeds you? 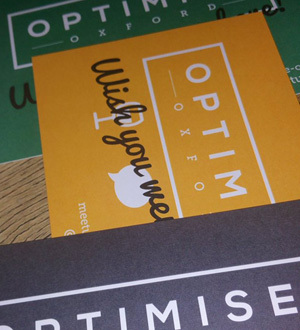 What’s nice about the Optimise Oxford meetup is that although it’s aimed at digital marketers, the range of attendees is broader and so is the range of talks. So this time round we had talks on social media (something I do), website migrations (something I’ve done) and programmatic advertising (something I hadn’t heard of before). The evening started with a double act from Oxford Dictionaries (part of Oxford University Press). First, content marketing manager Daniel Braddock spoke on ‘The links between social media and site traffic (and engagement)’. He’s done some experiments with social media posts that link to content on the Oxford Words blog, trying out variations in factors such as subject matter and post frequency. Interestingly, results were quite different for Twitter and Facebook. Posting more often on Twitter had a marked increase on website traffic but not on Facebook, presumably because Facebook limits the visibility of posts from brand pages. And, as someone who’s personally interested in Oxford Words’ subject matter, I was amused to see that Facebook and Twitter users respond to different types of content: Twitter users engage more with writing tips while for Facebook it’s punctuation. His colleague, programmatic and advertising operations manager Hannah Wright, spoke on ‘Optimising from the sell-side’. The Oxford Dictionaries website is an international reference site that carries display advertising. The challenge is to get enough advertising seen to please the advertisers but without alienating the users. And different users have different tolerance for ads: for example, a casual user looking up something on mobile during a pub quiz (something I’d never do!) wants instant results and no distractions. The final speaker was Daniel Bianchini from White.net who discussed ‘5 common pitfalls of a website migration, and how to avoid them’. Companies migrate websites for many reasons: to keep up with technology; because they’ve changed to a new content management system; as a site refresh; or to move to a new domain name. From an SEO point of view, this process needs to be managed carefully to ensure you don’t damage your search engine visibility and lose traffic. Some of the tips were about tools and tech; others emphasised the importance of relationships: with your internal team and with your client (who may need to be educated about best practice). I liked Daniel’s tip about redirects: ‘Go and make friends with your developer’. He suggested beer or coffee. Personally, I’ve always found that cake works well.